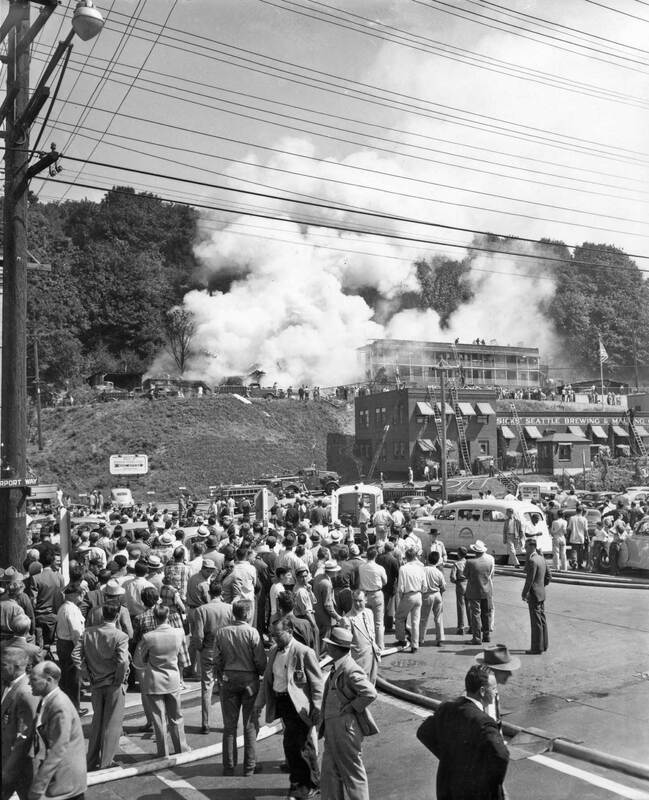 NOW: Judging from the most northerly and lowest part of the brewery, which appears here, in small part, to the left of the power pole at the scene’s center, Stevens Street has been relocated a few feet to the south of its position in 1951. We conclude this merely from attempting to align the angle of the brewery’s north façade, which appears in both views. 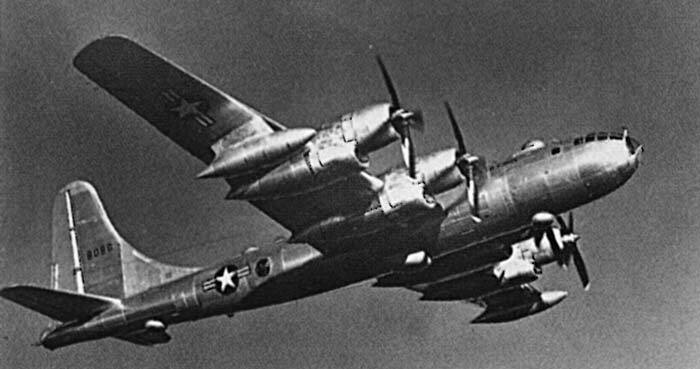 At seconds shy of 2:17 on the Monday afternoon of Aug. 13, 1951, a struggling Boeing B-50, less than a minute after taking off from Boeing Field and heading north, with its nose pointing up but its tail falling, just missed slamming into the tall brick tower of the Sick’s Brewery on Airport Way. The shaking 99-foot long bomber next plunged to the roadway between the brewery and the Lester Apartments plowing into the north end of the three-story tenement and instantly torching it with about 3000 gallons of splashing aviation fuel. 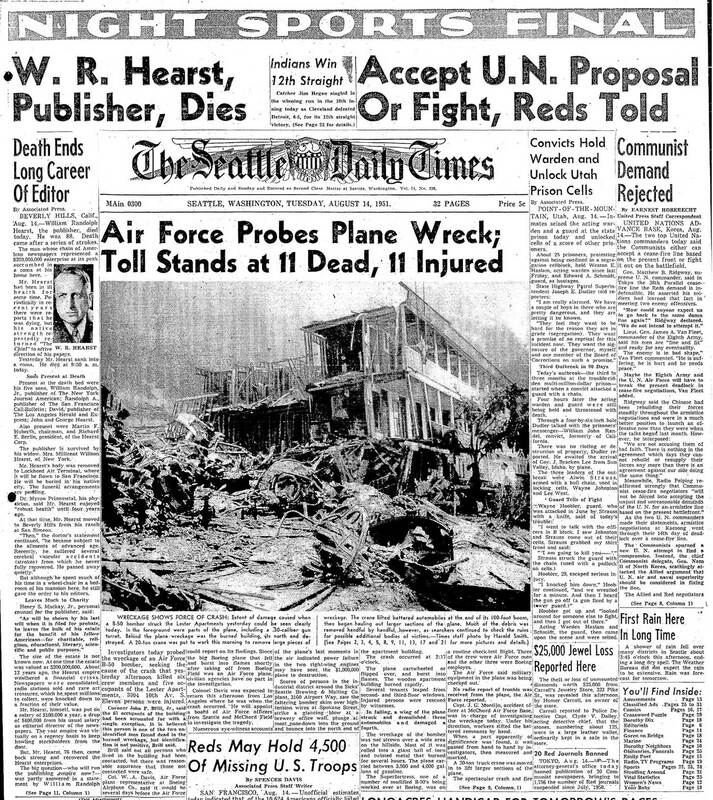 The Seattle Times, Monday August 13, 1951. Not an aerial, rather a steady shot taken from the tower of the Rainier Brewery. Along with the crew of six, five residents of the Lester perished. 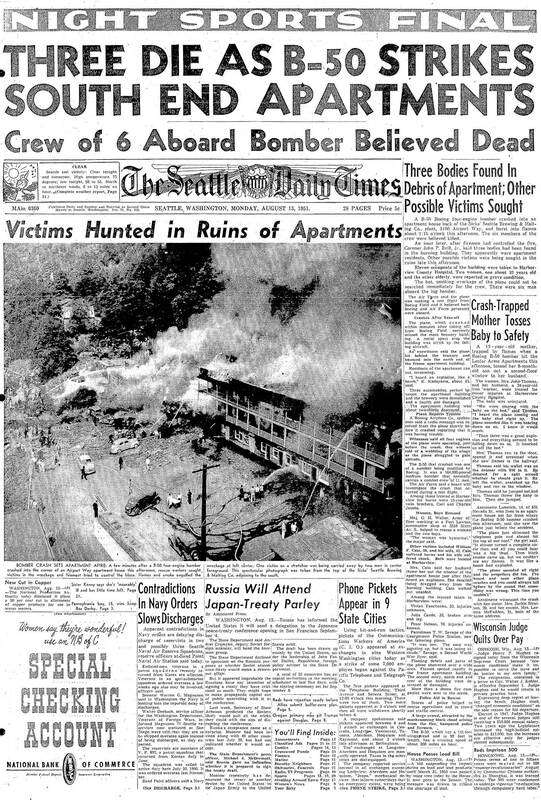 Many more were saved because of the adrenal-fired valor of Rainier Beer employees who rushed into the burning apartments helping pull many injured and/or panicked survivors to safety and the ambulances – and beer trucks – that rushed those that needed it to Harborview Hospital. The next day’s Times, Tuesday Aug. 14. The subject looks south, southeast across the wreckage of the bomber and into the north end of the apartment, the part flattened by the plane. 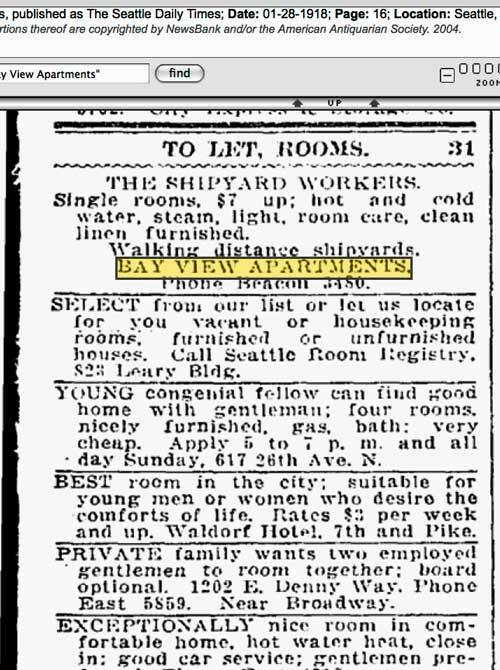 A typical apartment ad for what was then called the Bay View Apartments, and nicely situation for WW1 shipyard workers. The ad dates from Jan. 28, 1918. The destruction of the Lester revived its ignominious origins. 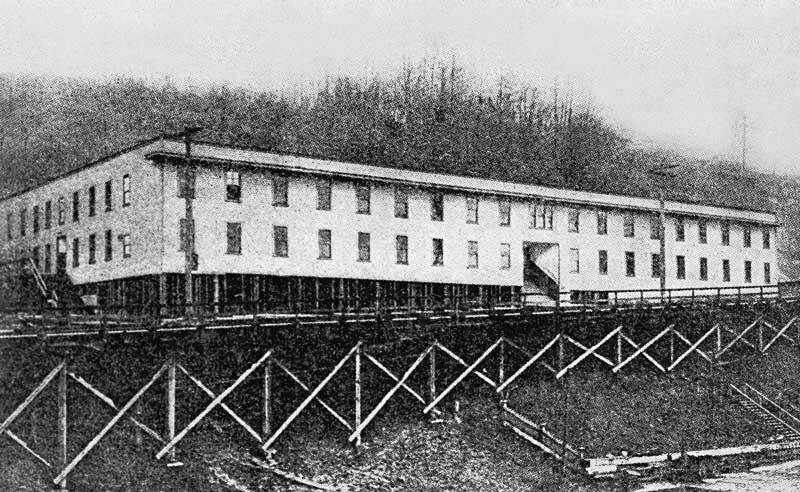 In 1914 the national publication, Harper’s Weekly, pictured it with the caption “the largest brothel in the world.” The scandal connected with its permissive construction on the city’s vacated 10th Avenue South – behind the brewery – spelled the end, by recall, of the rambunctious “open town” mayor Hiram Gill’s first term. Historian Murray Morgan, famous for his treatment of Gill and much else in his local classic “Skid Road,” recalled for me how one of Gill’s waggish contemporaries noted that the big brothel’s developer, the Rex Improvement Company, was misnamed – but barely. Without offering the correction, the party punster had noted that “Rex” was misspelled by one mere letter. Anything to add, Paul? Yes Jean, a few features from the neighborhood beginning with the brewery and a feature written long before there was any inkling of Tulley’s rise or rumored fall. 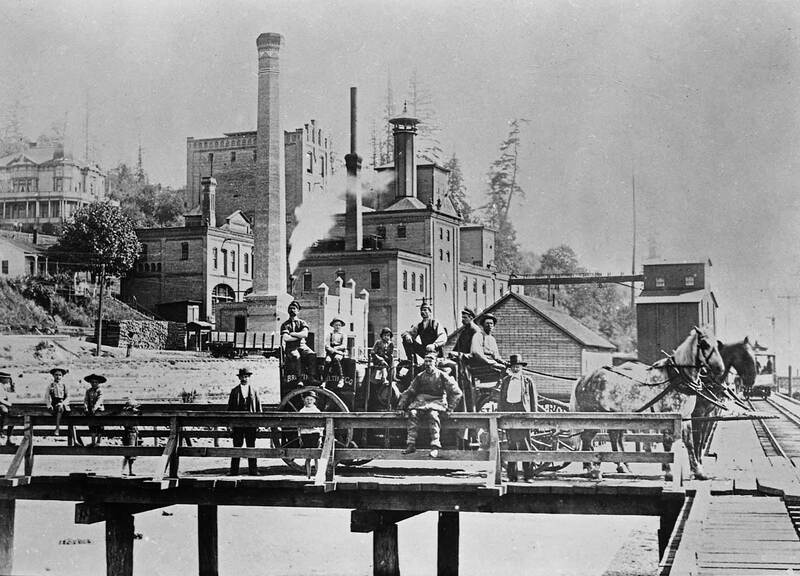 The Rainier Brewery in South Seattle, sometime in the 1890s. Jean’s recent repeat across Airport Way. 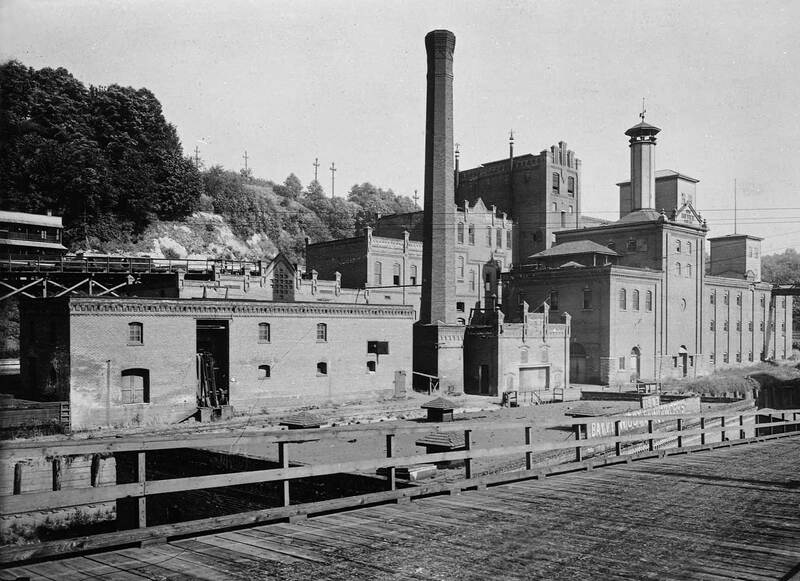 This historic view of Rainier Beer’s Bayview Brewery has been printed oft’ before. It is as easy to understand the scene’s popularity as it is to see that some of the brewery’s architectural features have survived into this century. Researchers vary widely in giving the photo a date. 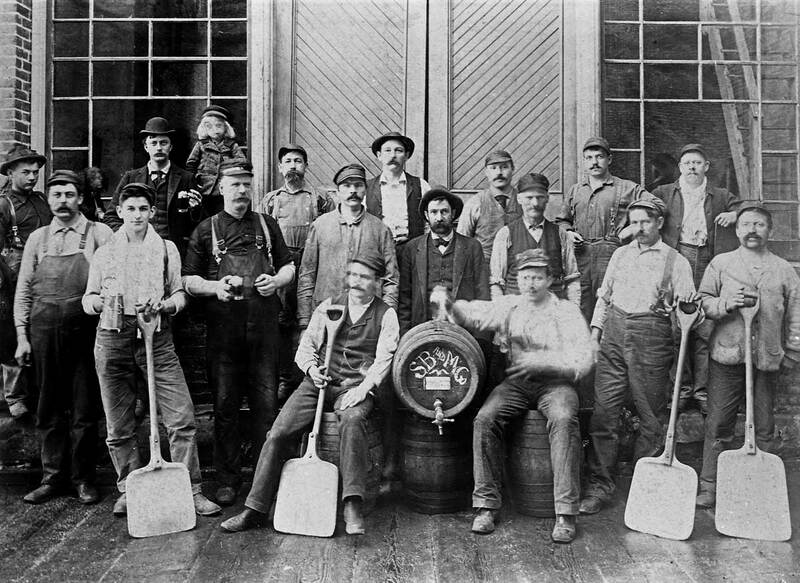 It has been documented that at the time this photo was taken, the corporate name of the brewery was the Seattle Brewing & Malting Co., which dated to 1893. 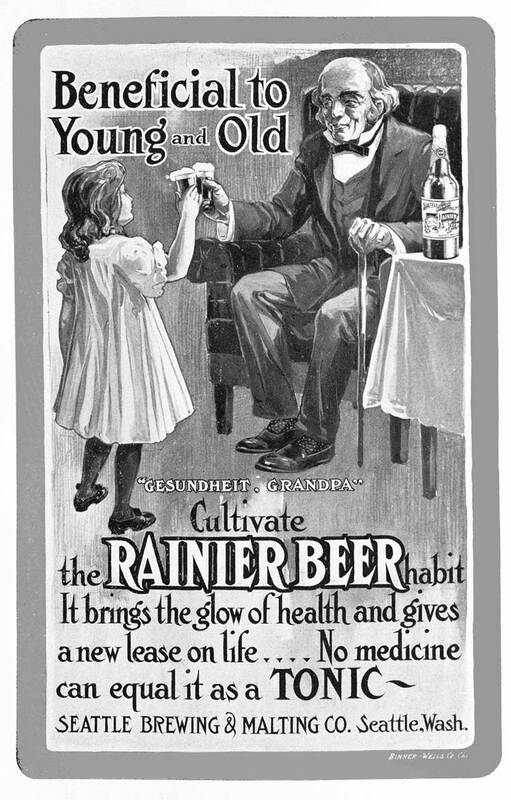 One of the brand names, of course, was Rainier. Accounts also vary as to when the founder, Andrew Hemrich, first came to Seattle. 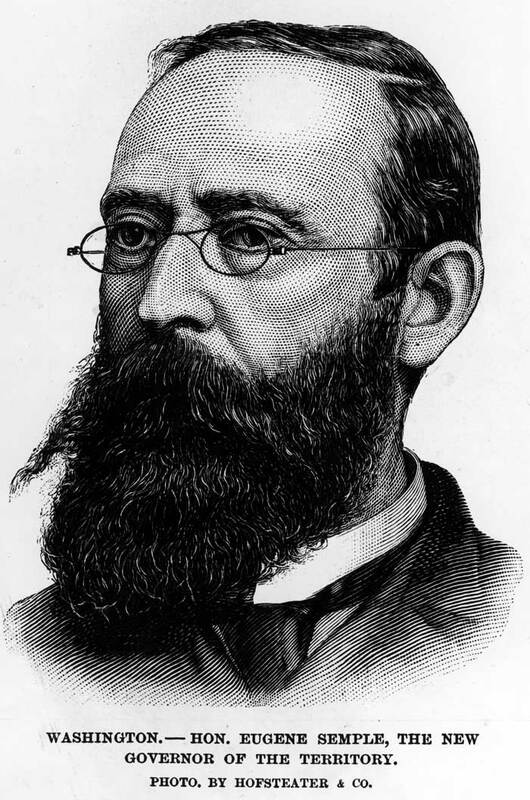 Some say 1878, others 1881, but most of the brewer’s biographers claim he arrived in 1883. Once in town, Hemrich joined with a John Kopp in building a brewery here at Bayview just above the tidewater that then still lapped against the western slope of Beacon Hill. 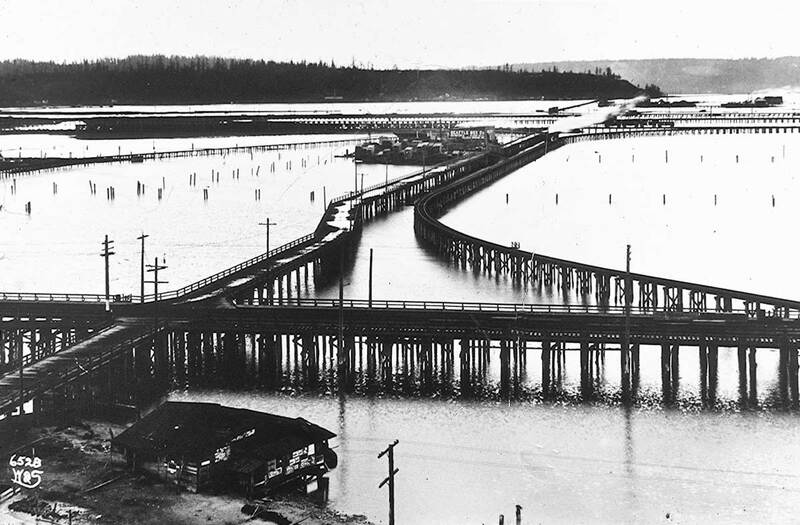 Since there was then still no year-round waterfront road into Seattle, the first barrels were brought to town in a rowboat. On the scene’s far left is the mansion Hemrich built for his family in 1892, and on the far right are the narrow-gauge tracks of the Grant Street Electric Railway. Hemrick next built himself another brewery down the viaduct in Georgetown. 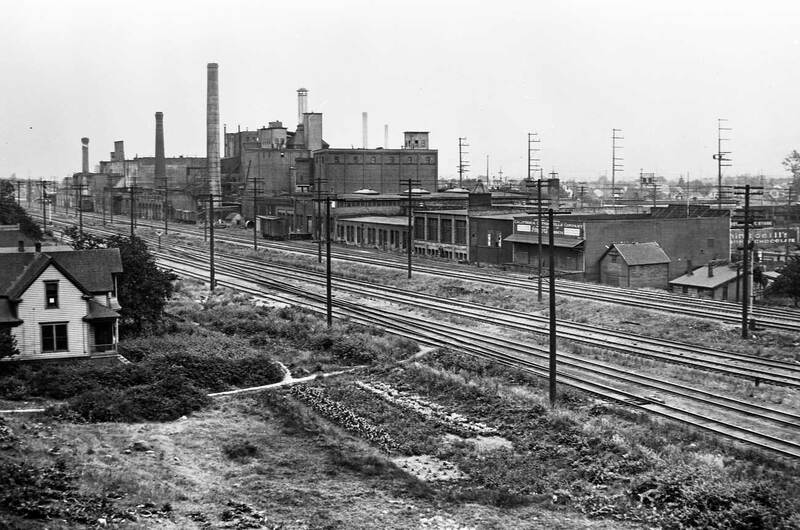 When Prohibition dried the state in 1916, the company’s Georgetown plant was claimed to be the sixth largest brewery in the world and the largest industrial establishment in the state. The mainline track side of the Georgetown plant looking southwest into Georgetown. It was not until 1957 that Emil Sick managed to purchased the nationwide rights to the Rainier label. By then the Sicks’ kingdom had grown into what the company claimed was the world’s largest brewery system. 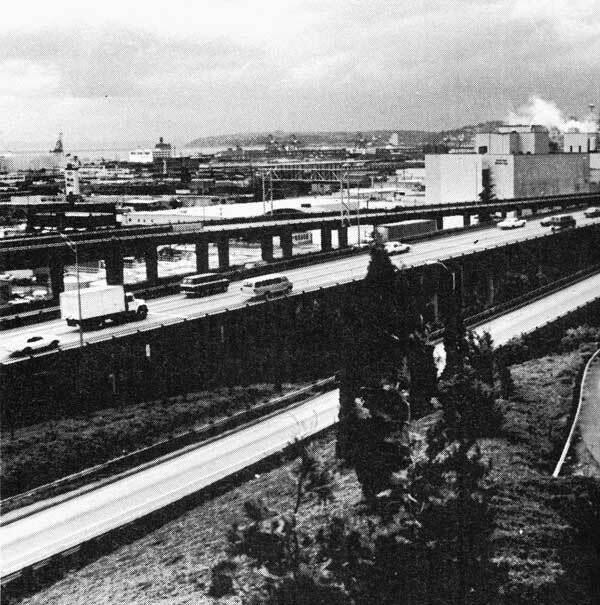 Five years later the Rainier label operations were consolidated into the Bayview plant. 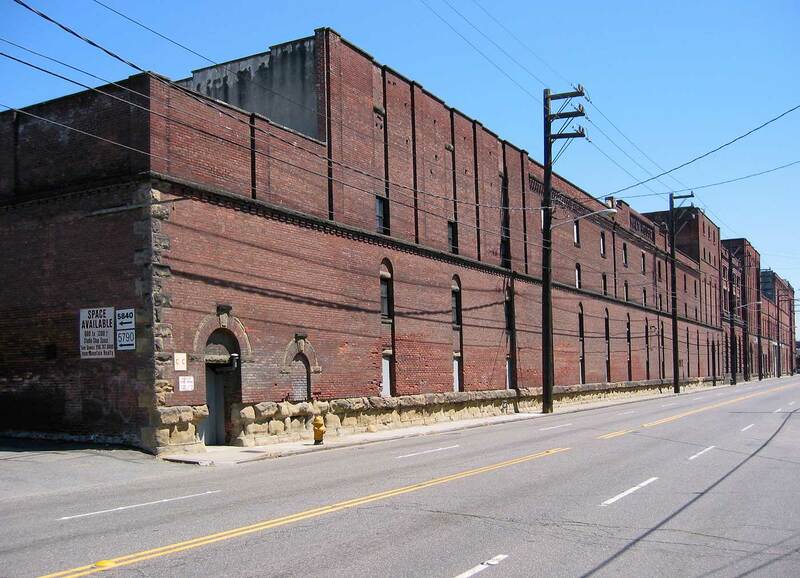 ADDENDUM: A decade or so after my little essay above was published in 1988, the Rainier Brewery was sold first to Stroh’s and then by Stroh’s to Pabst – the beer “in the land of sky blue waters” – which closed and sold the brewery in 1999. 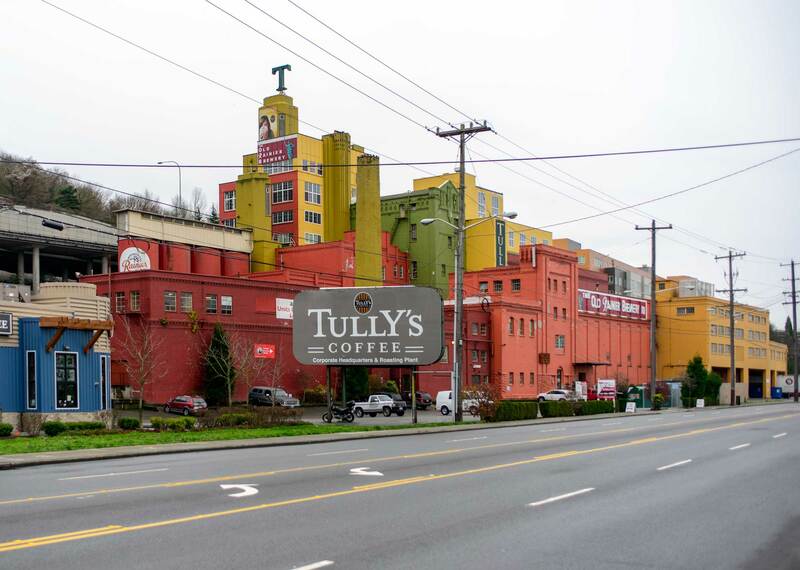 The big R on the roof was replaced by a big T, to celebrate the plant’s conversion into Tully’s Coffee headquarters, and a few other stimulated enterprises like band practice rooms, a motorcycle fabricator, and a winery. About Tully’s recent difficulties I know too little to make any recommendations except to lower the prices on their drinks. Above: Asahel Curtis’s 1904 portrait of Seattle Malting and Brewing Company’s big plant in Georgetown. Below: Staying in the 20th Century my black-white copy of it from the late 1990s. In 1903 photographer Asahel Curtis began photographing the Seattle Malting and Brewing Company’s new Georgetown plant. On Jan. 25, 1904, his first return of many, he struck this vertical “portrait” view of, from left, the Malt House (with-the Moorish-minaret chimney), Brew House (with its twin ornamental tops) and Stock House. Out of frame the brewery continues far to the right, reaching a monumental length of 885 feet. 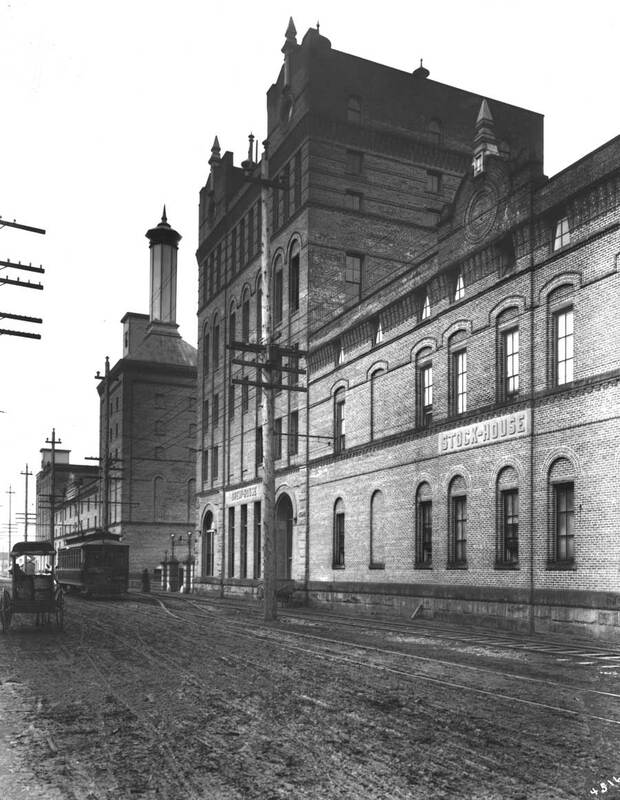 By 1904, this was the largest brewery west of the Mississippi River. With additions, by 1912 it had become “world class” – the sixth-largest in the world. Before Washington introduced Prohibition in 1916, for a time the brewery was the largest industrial establishment in the state. 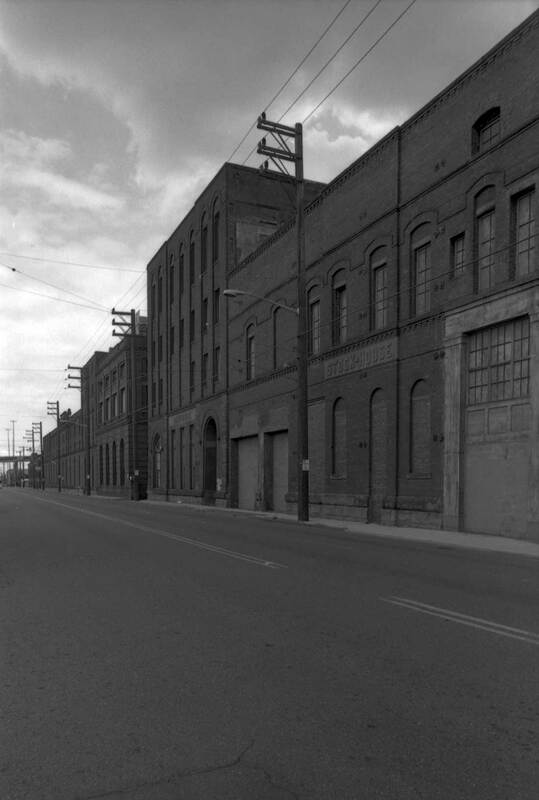 In 1904 Georgetown incorporated – a “company town” safeguarding the business interests of its brewery. Company superintendent John Mueller was soon elected both mayor and fire chief. 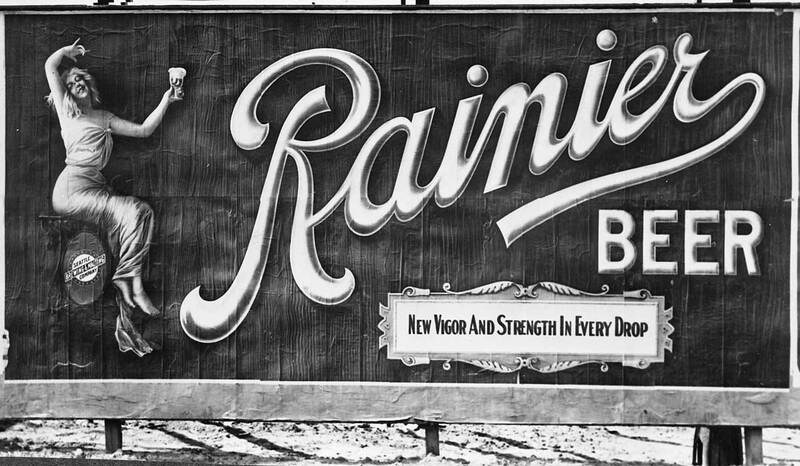 The number of taverns and roadhouses doubled, and by 1905 it required 25 horse teams to daily fill the Seattle appetite for Rainier Beer, the primary label of the brewery. 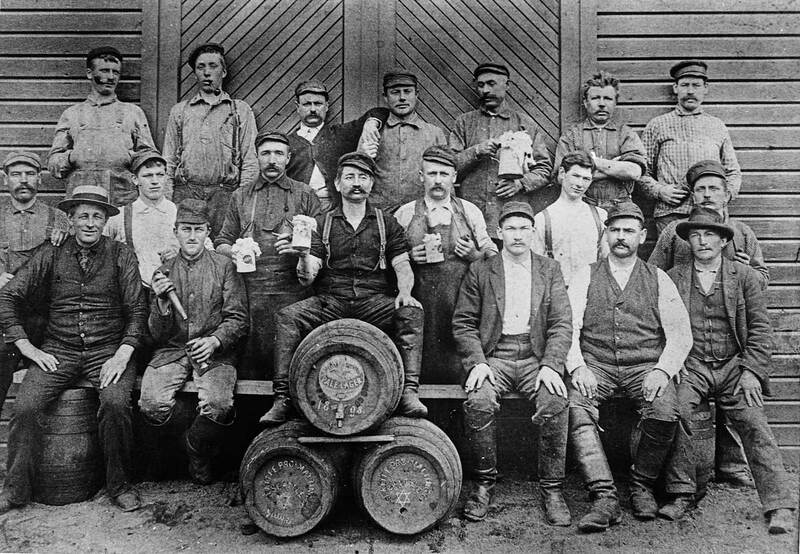 That year the brewery employed more than 300 men. There was room to build worker homes beside the Duwamish River, which then still curved through Georgetown. 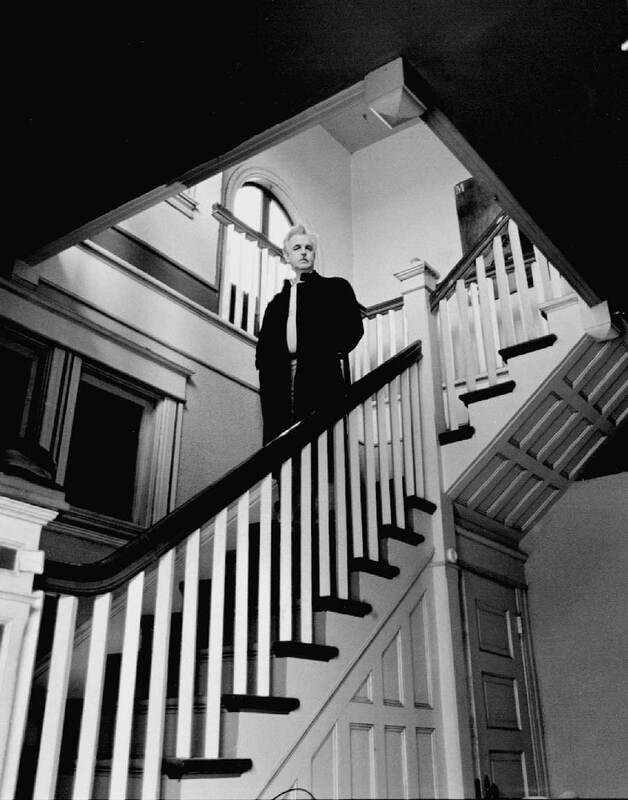 Tim O’Brian on the grand stairway of his Georgetown Home, ca. 1988. 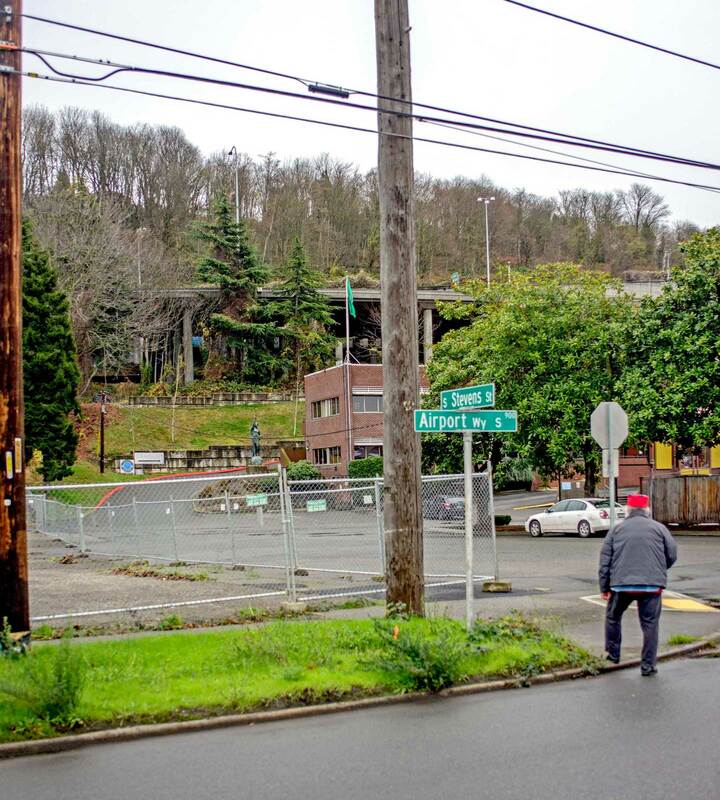 Reaching around the Rainier Brewery, Eugene Semple’s trestle begins its distribution of Beacon Hill onto the tideflats while beginning to also excavate for his proposed South Canal to Lake Washington – through Beacon Hill. It might have made Columbia City an ocean port. Not finding the original negative I scanned the print of the “now” of Seattle Now and Then Volume Two. The book is out of print, but can be read in-toto on this blog. Here’s one of Seattle’s historical believe-it-or-nots. When you ascend Beacon Hill from the Spokane St. interchange off 1-5, you are steaming up South Canal. In 1895, an ex-governor of Washington, Eugene Semple, proposed taking on three herculean tasks at once: the straightening of the Duwamish River into waterways, the cutting of a canal through Beacon Hill from Elliott Bay to Lake Washington, and the reclaiming of 1,500 acres of tidelands with the dredging from the river and the droppings from the hill. Yet, five years later, the only way to approach Beacon Hill by water was still in a row boat at high tide. By then Semple had reclaimed only 175 tideland acres. His detractors attacked this “specious and mischievous undertaking” to cut through the “quicksands and sliding clays” of Beacon Hill. 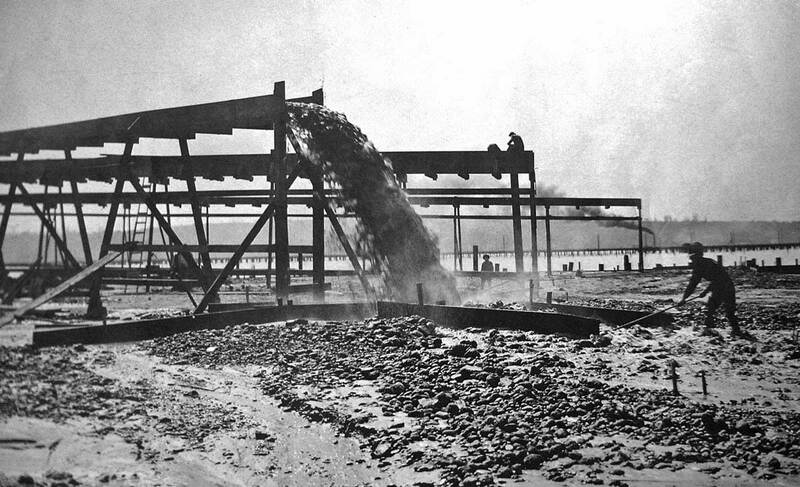 Instead, they promoted a North Canal, the one that was eventually completed via Salmon Bay and Lake Union. 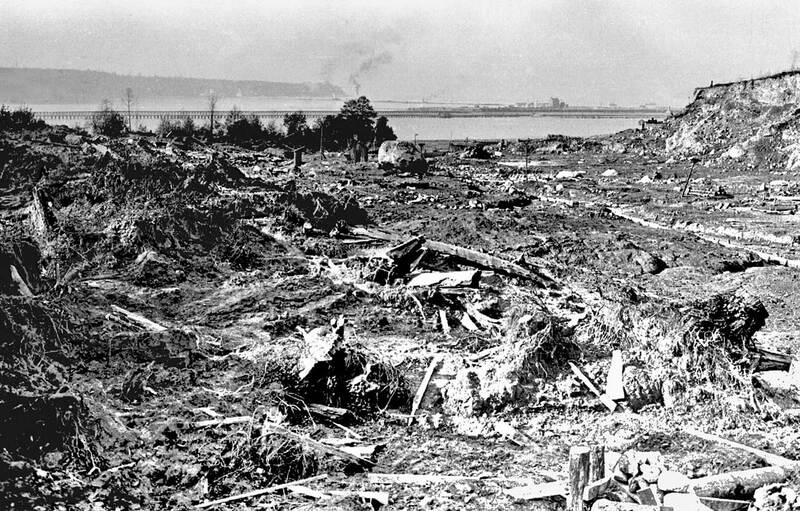 You can see that flume running out of the bottom of the historical picture and into the high tide which twice a day covered Elliott Bay’s mudflats. The plan, of course, was to direct more mud through this flume and to cover the tidelands below with the hill above. And it worked – for awhile. Then the soft hill refused to be sculpted for ships and capriciously began to cave in. This may be recorded during Semple’s grand undertaking or nearby a few year later during the Jackson Street Regrade. Eugene Semple was forced to abandon his South Canal. Today, it has been reclaimed by a greenbelt and the more modest incisions of highway engineers. Their work was made easier thanks to Eugene Semple’s first cut into his South Canal. Looking west from Beacon Hill to Pigeon Point (the darker headland) and West Seattle, on the horizon. This is an early Webster Stevens print from the studio’s collection at the Museum of History and Industry. 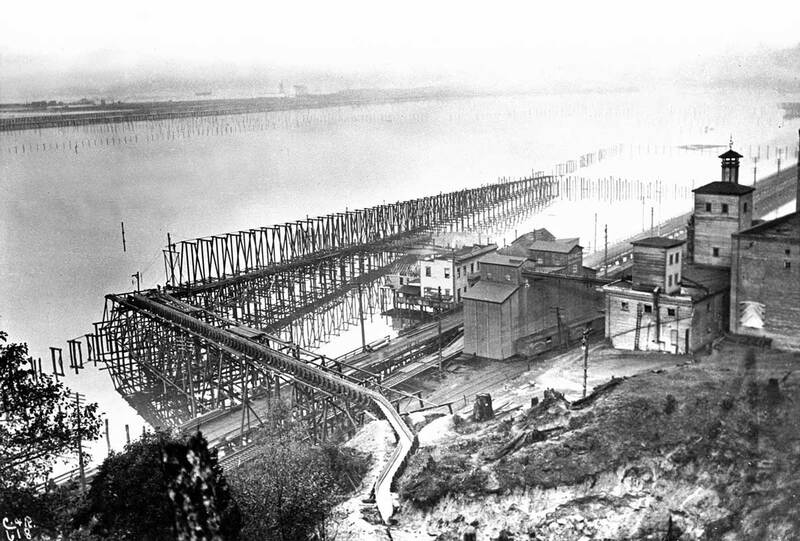 Taken around the turn of the century (1900), two timber-trestle streets intersect for a “crossing the T’s.” Looking west from Beacon Hill, we see the trestle built above the tide flats south of Pioneer Square on Grant Street, now called Airport Way. If you follow the second trestle, Spokane Street, it leads to the dark peninsula in West Seattle called Pigeon Point. 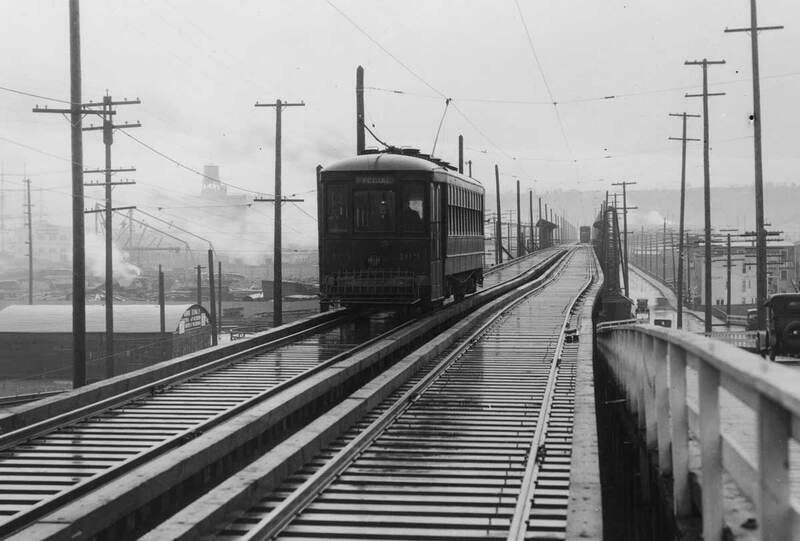 The first West Seattle bridge across the Duwamish River’s main channel is half hidden behind the screen of steam escaping the engine on the track parallel to Spokane Street. The original negative is part of the Webster & Steven Collection at the Museum of History and Industry. Perhaps the popular W & S studios photographed ” this scene for Emmett Nist. That’s his Seattle Tacoma Box Co. sitting on pilings in the center of the photo. The Nist company moved to 401 Spokane St. from its Lake Union plant around 1900 and stayed until 1975, when its Seattle and Tacoma .divisions joined in Kent. The old tidelands site at Fourth Avenue South and Spokane Street is now a City Light lot. 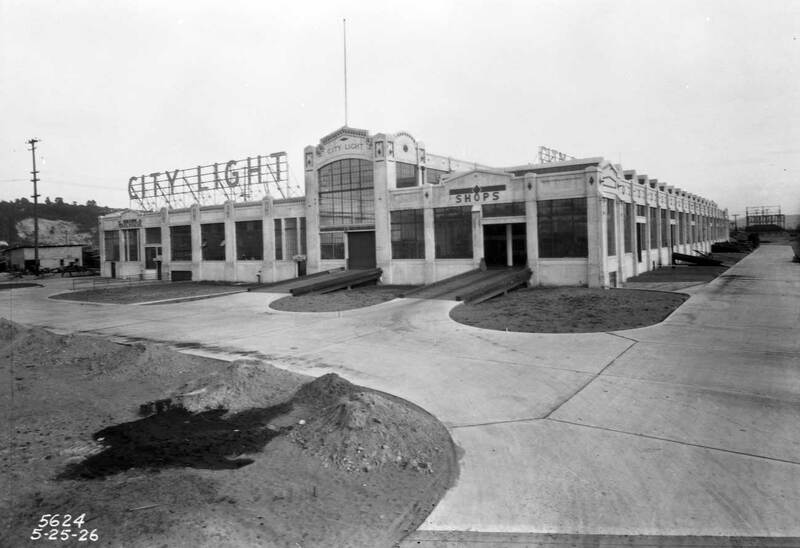 Seattle’s Municipal Power opened its South End Service Center on Spokane Street in 1926 – the year of this photograph – on land recently reclaimed from the tides. Seattle architect J.L. McCauley’s public building was not only functional but attractive. As the historical scene reveals, the restrained ornament used in the service center’s concrete forms has been enhanced with a skillful wrapping of the building in a skin of stucco and off-white plaster. Signs for the structure’s principal roles – warehouse and shops – adorn its major division, to the sides of a slightly off-center tower where “City Light” is tastefully embossed on the arch just beneath its flag pole. The name is promoted twice on the roof, with block letters about nine feet high illuminated at night with about 400 bulbs for each spelling of CITY LIGHT. This saw-tooth roof, which runs nearly the length of the center’s west (right) wall above the shops, is to these eyes the historical plant’s strongest architectural feature. Such tops were once commonplace in this industrial neighborhood. NOT City Light’s sawtooth roof but another I recorded while having a studio in the neighborhood in the late 1970s. 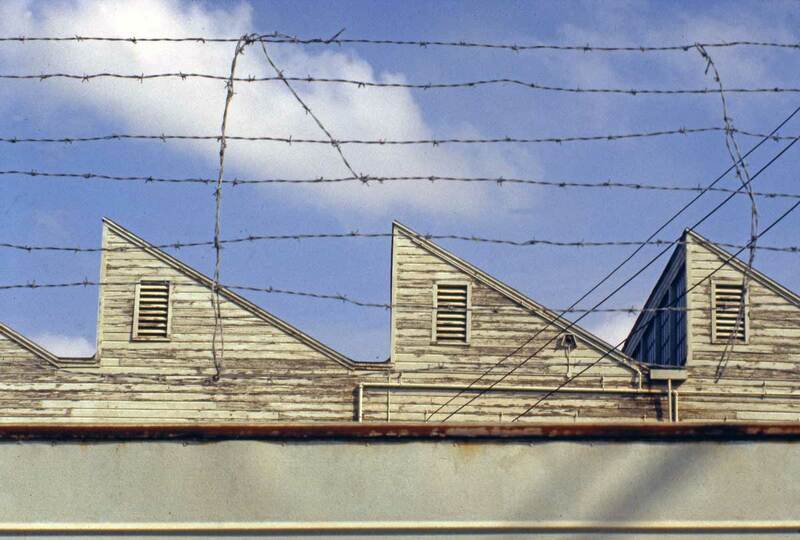 This roof may still be efficiently letting in the light, and the barbed wire keeping out the darker forces. The twenties was a decade of endless tests for City Light, as it developed the first of the Skagit River’s generators, Gorge Dam, and fought a service war with Puget Power when lines for the public and private utilities were still duplicated throughout the city’s streets. Another scanned clip from the Pacific article, which we hope to replace with a “more perfect” scan from the negative itself – when it shows itself for, it seems, we will not make a great effort to find it. The reason for choosing this prospect is explained in the text below. Ascending the Beacon Hill ridge was once an aerobic exercise. Most of these climbs from the tideflats were on timber trestles like this one. It meanders from the neighborhood of South Seattle to Seattle’s Beacon Hill reservoirs. This Bradford Street stairway was peculiarly precarious. Just to the south (right) of this scene the land falls away into a pit carved years earlier by the Seattle Brick and Tile Company, one of the many brick manufacturers that flourished with the rebuilding of Seattle after the “Great Fire” of 1889. Still near the bottom of the climb. 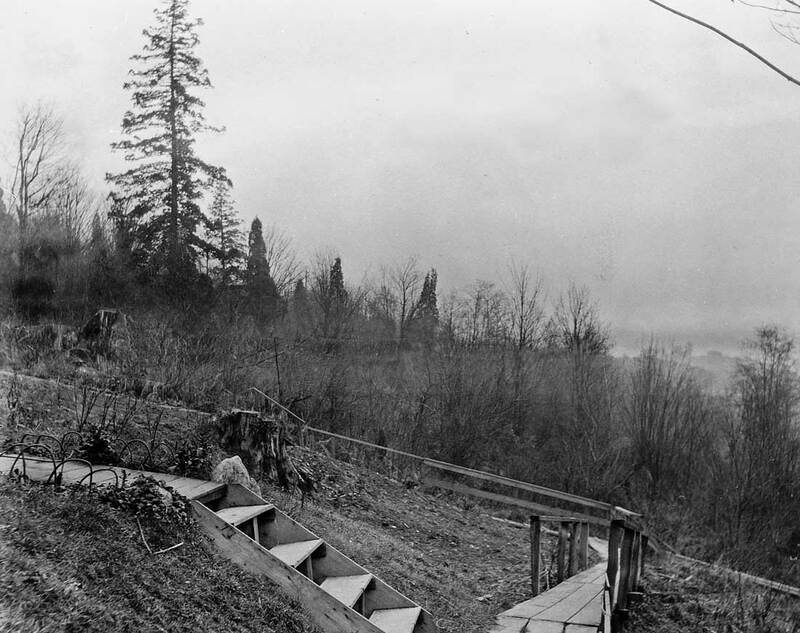 Ken Manzo, who as halfback for Cleveland High School’s 1937 city-champion football team counts as one of South Seattle’s favorite sons, remembers these stairs -vividly. On his paper route he climbed them daily, carrying the Seattle Star to his subscribers on 13th Avenue South. Manzo’s three-block ascent from 10th Avenue South gained 250 feet. Near the top and looking south over the top of the pit created years earlier by the Seattle Brick and Tile Company. 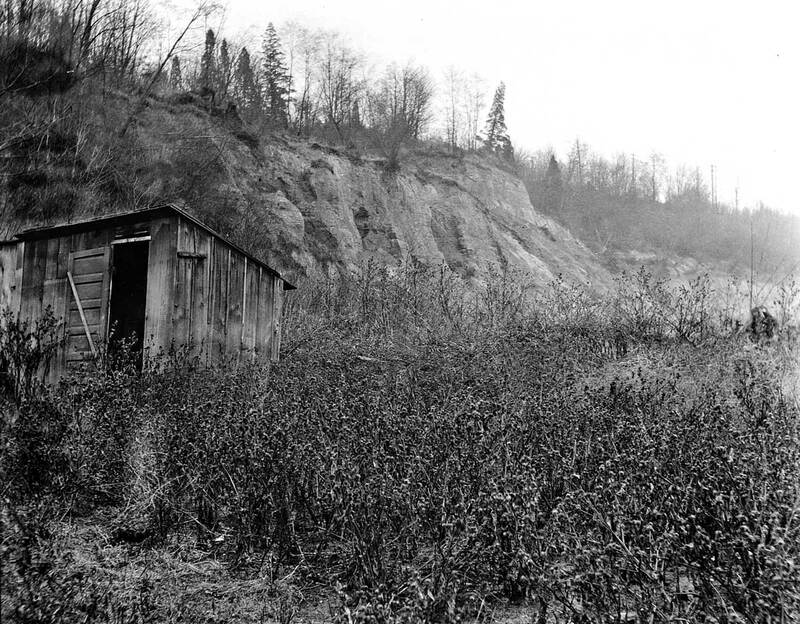 While fine for mining clay, the unstable glacial till of Beacon Hill was inclined to capriciously slip away. 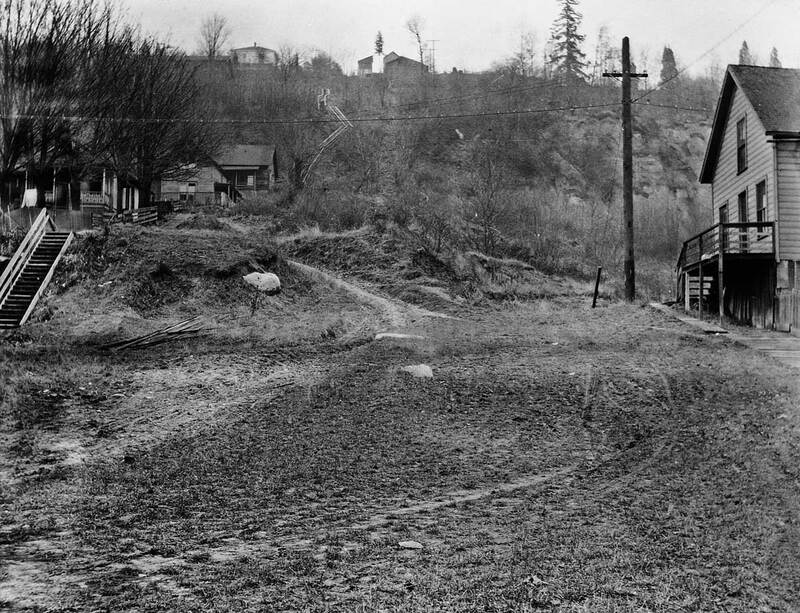 This public works scene was recorded as evidence that the Bradford Street foot walk and the houses on the left had neither fallen into the hole nor seemed likely to, following the latest cave-in at the pit. These four photographs of the Bradford Street stairs were recorded for the city’s public-works department on Dec. 15, 1916. Since then all inherited streaks while waiting for light – or fresh air – in the public works archive. The photographer notes the precise location of each negative. With the photo at the top we are “at a point 4 feet south of the intersection of the east margin of 10th Ave. South and the north margin on Bradford Street.” Today that’s the middle of Interstate 5. In the contemporary scene (When we find it, it will taken the place of the clipping scan we use here.) 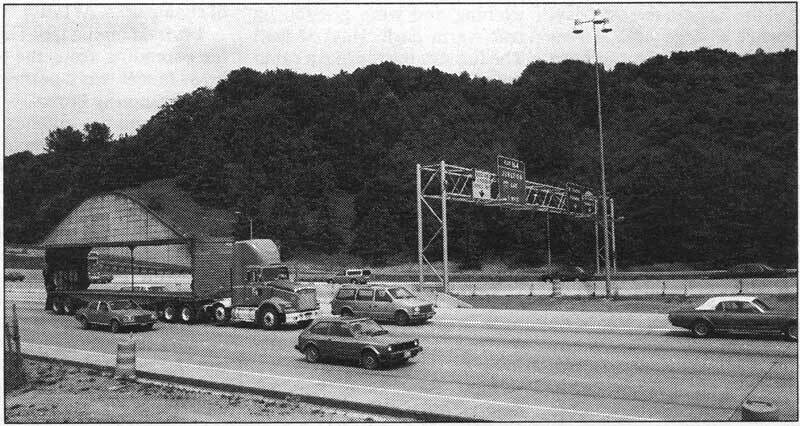 the historical photographer’s roost was about midway between the overhanging highway sign above the freeway’s northbound lanes and “the concrete wall beyond it. Near the top of the Bradford Street steps. This fanciful structure was the second of four Maple schools. 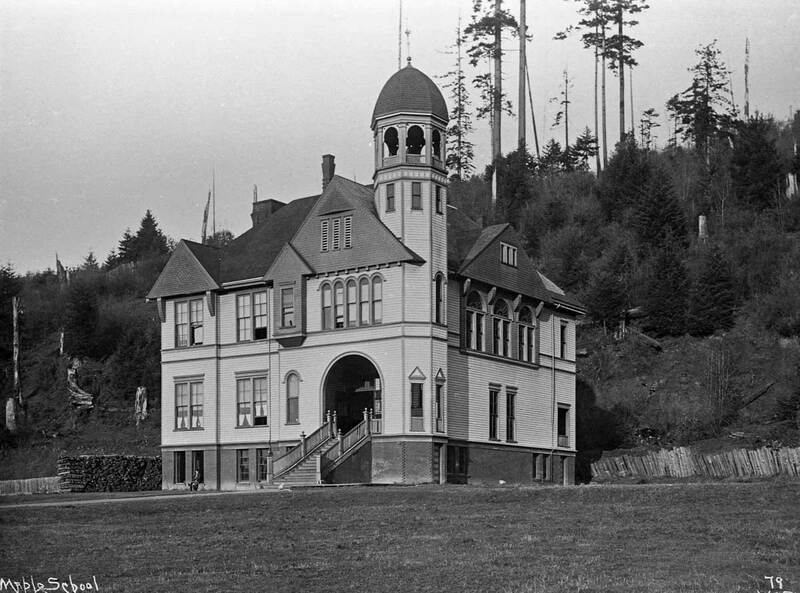 The first was sited on what is now Boeing Field, and when constructed in 1866 it was the first schoolhouse in King County intended specifically for instruction. John Wesley Maple, 30, son of one of Seattle’s original settlers, was the first teacher. It was a job the future King County treasurer, which he later described as “the hardest work that I ever had undertaken.” Maple had 20 students, all of them small children except for 15-year-old Eliza Snyder, whom he later married. Maple’s one-room schoolhouse was replaced in 1900 by this framed creation. The tower, coped ornaments and wide front ‘steps are monumental in their rural solitude. 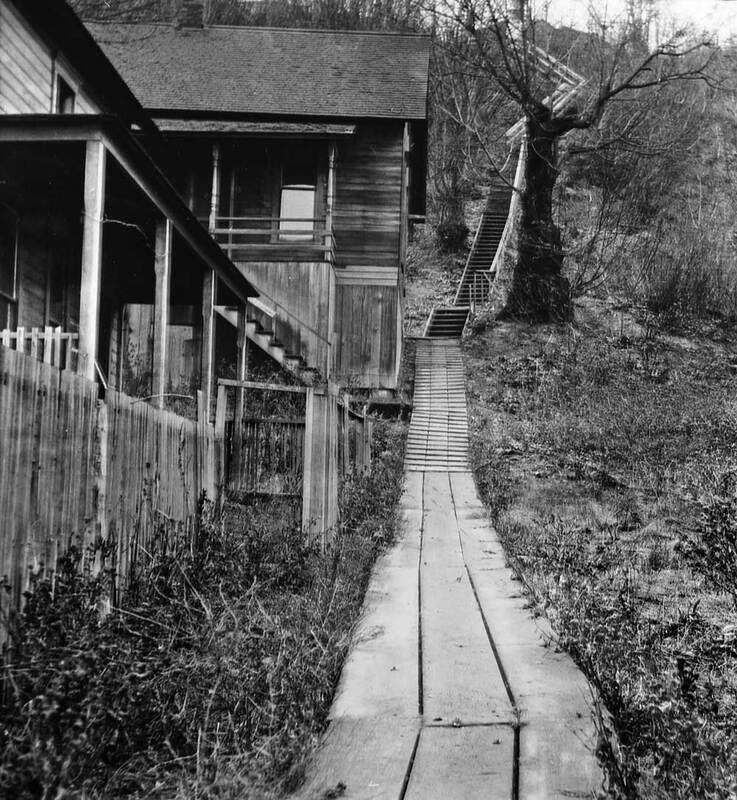 In 1907, however, the Oregon and Washington Railroad purchased the land and the schoolhouse was soon thereafter destroyed for the railroad’s right-of-way. The third Maple School was built up the Beacon Hill ridge on the future site of Cleveland High School, and when construction began on the high school in 1926, Maple primary was jacked up and moved two blocks to 17th Avenue and Lucile Street and there remodeled. The most recent and modern Maple Elementary School was constructed in 1972 at a fifth site, Corson Avenue South near Ferdinand Street. Serpentine was the most common description for the Duwamish River before it was channeled into a waterway. Within the 13 & 1/2 miles that were straightened and shortened to 4 & 1/2 miles was the Oxbow, the first large S-curve south of the river’s mouth. In 1911, First Avenue South was extended over the Oxbow with a swing span bridge. Five years’ later, the river was straightened to bypass this Oxbow twist and the old channel was filled in. This scene, photographed Feb. 24, 1916, shows that work in progress. The photographer looks north from the bridge’s south approach. By the end of year the river had abandoned its bridge, so the span was dissembled, moved about 300 yards south of its original site and rebuilt across the Duwamish’s straightened channel. In its second fitting, the Oxbow Bridge-was no longer in line with First Avenue South and the bridge’s curving approaches introduced a new oxbow onto the scene. Inevitably, this S-curve, combined with the narrow bridge’s two tight lanes, created one of the city’s worst traffic bottlenecks. In 1955 the present bascule bridge was built midway between the ‘ old Oxbow Bridge’s two sites. The contemporary photo (when we uncover it) was recorded within a few yards of the spot on the old bridge picked by the historical photographer. The parked vehicles in the “now” sighting are grouped on a pie-shaped strip between the new bridge’s busy approach on the right and a quiet First Avenue South on the left. The traffic relief brought by the new bridge was short-lived. Eventually it would earn the reputation as the city’s most dangerous span. 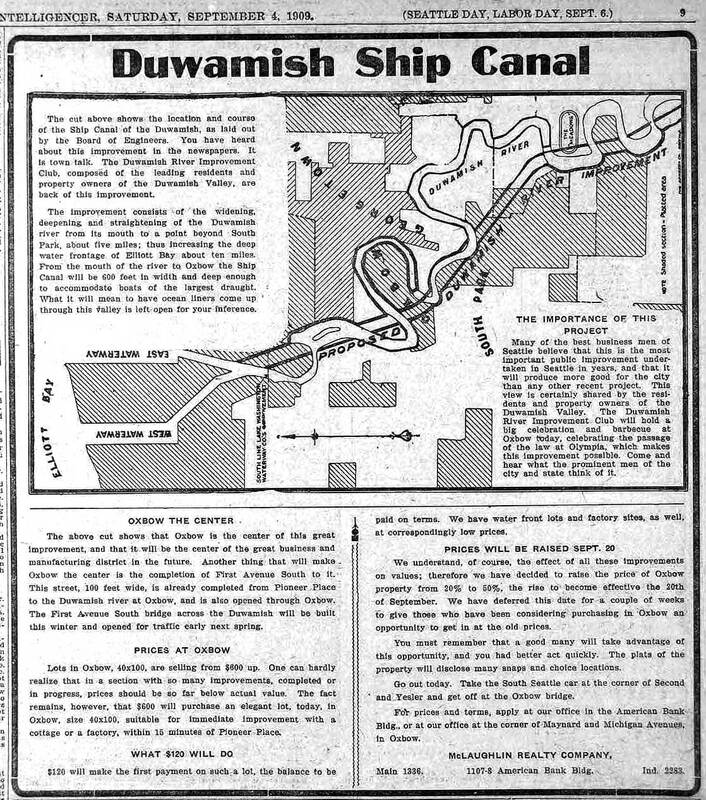 A 1909 clipping on the Duwamish Waterway project including the river’s Oxbow as one of its primary named features. 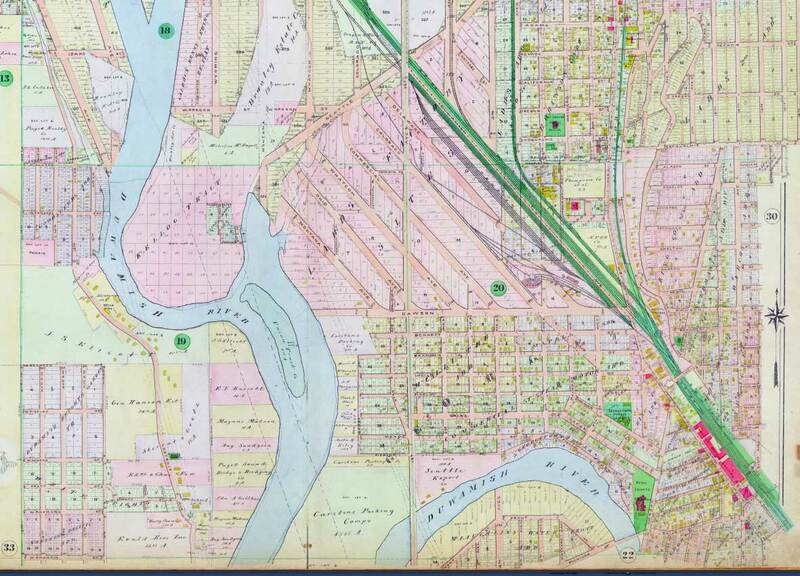 First Ave. South moves down the center of this detail from the 1912 Baist Real Estate Map. 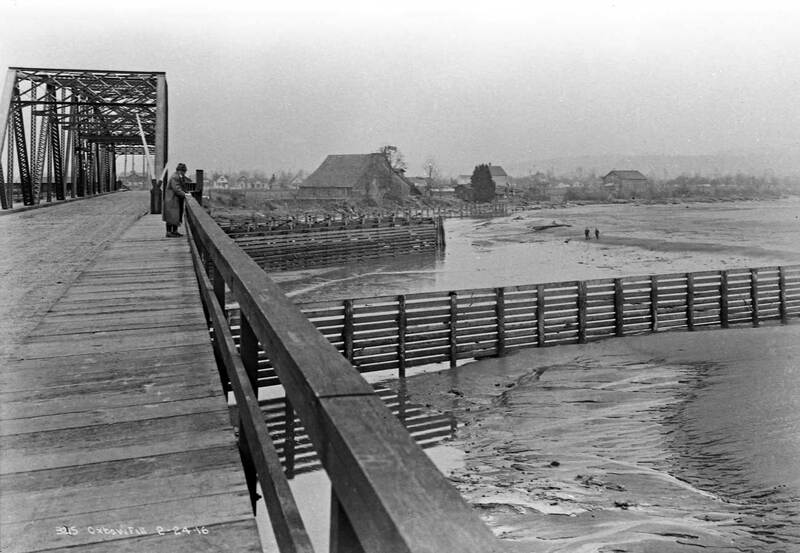 It cuts through a diverse grid and – delivering a bridge a year earlier in 1911 – it reaches the Oxbow – still – of the Duwamish where the river turns to and through Georgetown. The red footprints, far right, are for the parts of the red brick brewery featured here near the top.